Discussion in 'Grappling Technique' started by PikeKing, Mar 23, 2008. I did my first Judo class ever on Wednesday, finally. Can anyone recommend a good book or DVD for a complete beginner? I would'nt worry about getting books/dvds just yet. Get some fundamentals first, and just train. What club are you at anyways? What PSJJJ said. Books can help you a little with Judo, if they reinforce stuff you learn in practice, for the most part though practice>books. If you really want a book, Judo Unleashed is a good choice. learn stuff first nothing will get you owned like you trying stuff you havent been taught yet . just go to judo info.com has all you need . I second that. 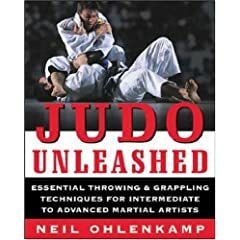 Judo Unleashed is a great book, but without a good base of skills learned on the mat a book will only get you pounded. With all due respect to Kano, this is the most detailed, best-photographed, book dealing EXCLUSIVELY with throws that I have come across. Reminds me of a college textbook with its thoroughness/attention to detail. No pins, subs, or kata. Plus, it goes into variations of each throw. Good book if you're looking to blend judo into your BJJ. Plus, that choke he does on the cover has been working for me lately:icon_chee. I'm also a Judoka and would suggest trusting your teachers until you have a firm understanding of the basic moves. Meanwhile I would honestly recommend just typing in "Judo" on youtube and going from there. In my opinion videos are 10x better than books for learning. I think that book more of a master text for mid-level Judoka and up. It's extremely complicated and written in a way that a novice wouldnt understand without absolute focus. For a beginner I would recommend Judo unleashed. Covers everything. Classifies the types of moves. Has a Japanese glossary, charts explaining follow up, set ups and counters. Rule explanations, and details on philosophy explained in a way that even non martial artists can understand. It's Newaza section is really weak, but I think it was done that way because they know there are tons of books covering that subject extensively. If you do get Judo Unleashed, I recommend having a look at the techniques. When one catches your eye, go into class and ask a coach/higher belt how they do it. As long as you are training with supervision, books can't hurt that much. I'm travelling right now in Asia and its the one book I brought with me as a training aid. Judo is but one item in a comprehensive list of sports instruction aids made available on a non profit basis by the Athletic Institute. The photographic material in this book has been reproduced in total from the Athletic Institute's sound, color filmstrip kit, Judo. Special thanks to zeerebel for the share! Just train my friend, dont worry about books or instructionals or anything like that. When you do wanna look around, the best thing to get would be vids of comps. dave caramillo got it right by not looking at it as two arts when the two can be so much more if they combined . ever see his fight agaisnt his brother on you tube ..wow great stuff . Dave Cams book is good, but nowhere near as much info as Judo Unleased. Camarillo's book assumes a decent basic knowledge of Judo. Honestly, some of the stuff in his book won't be useful to someone new to Judo for quite a while. daves is more if you have done either of the two and need a liitle more prespective . thanks for advice guys, I'll see if i can pick up Judo Unleashed. and i appreciate everyone saying just train, I agree, unfortunately I cant make classes as regularly as I'd like because of my job. I started Judo at 30 and I'm the only white belt in the class, just thought any info in my head is better than none. try Mastering Judo, good, basic book, with a lot of good info for people just starting in the art. Oh, well that's a different story. In that case I would sincerely suggest www.judoinfo.com. They have prictures and animations of every throw, hold-down or submission you can think of. Also join the site's forum, there's alot of great judo players there who will help you out in a heart-beat. Feel free to ask questions here regularly aswell, nothing is unimportant if it helps out your game. My personal advice to you, since you won't be attending as much as you'd like to, would be to keep yourself in relatively good shape as to avoid injury and to not completely drain yourself when you do go to practice. Run as often as you can, lift if you can and do some uchikomis against a wall (put your hands against the wall, cross your right foot in front of you and follow your left foot up to the wall... just like you would going into a throw). i will prob make 5-6 classes per month, maximum. do you think starting at 30 is bad?